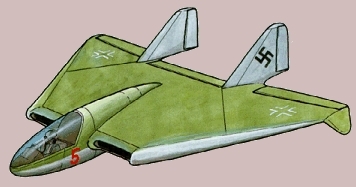 In early 1944, due to the fuel shortage in Germany at that stage in the war, Dr. Alexander Lippisch and his design team though to use other kind of material be the alternative fuel for the power of his ramjet fighter designs, such as P.13a. They tried "coal" powder and designed a hexagonal / round shaped chamber which was suitable for coal combustion, and was refilled from top center. However, the fuel chamber could not fit into the P.13a fuselage. 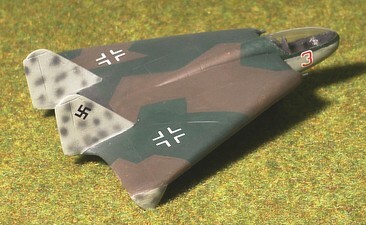 It was led to the follow-on design, the P.13b which was started in November 1944. 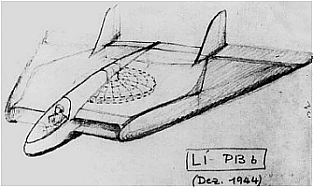 It also featured a delta wing plan design as Lippisch's favorite. The cockpit was moved forward for better pilot's visibility. The double rudders were chosen to provide steady flight. 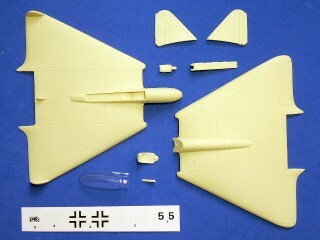 The main landing gear was the retractable landing skid, and rear rested on the reinforced wingtips. No actual craft was built as end of the war. It only stayed in stage of concept sketches. The Lippisch Li.P.13b is suitable to group with the following collection series.